Astronaut Steve Bowen, STS-126 mission specialist, participates in the mission's first session of Nov. 18, 2008 spacewalk as construction and maintenance continue on the International Space Station. Thisstory was updated at 8:41 a.m. EST. Twoastronauts will celebrate the International Space Station?s 10th birthday withsome mundane, but much needed, spacewalk maintenance today. Endeavourshuttle astronauts Heide Stefanyshyn-Piperand Shane Kimbrough are slated to float outside the station?s airlock at 1:45p.m. EST (1845 GMT) for the second of four spacewalks aimed at cleaning andlubricating a jammed solar array gear. But today?sspacewalk will be the $100 billion space station?s first of a new decade inEarth orbit. Its first element, the Russian-built Zaryacontrol module, launched into space 10 years ago today. ?It?s hardto believe it?s been 10 years,? said Kirk Shireman, NASA?s deputy stationprogram manager, who remembers it being a cold day on the steppes of Kazakhstanwhen Zarya roared spaceward from Baikonur Cosmodrome. ?This Thursday is a majormilestone for the space station.? Zarya wasthe first station?s first room. Since its 1998 launch, the outpost has grownfrom an orbiting studio apartment into a three-bedroom research laboratory witha Canadian robotic arm and modules from Russia, the U.S., Europe andJapan. The spacestation has circled the Earth more than 57,309 times and traveled a distance ofmore than 1.3 billion miles (2 billion km). About 165 people from 15 differentcountries have visited the 313-ton orbiting laboratory. Endeavour?sastronaut crew is delivering vital hardware to double the space station?s crew capacityup to six astronauts per mission next year. Chief among their cargo: a water recyclingsystem that converts urine, sweat and wastewater back into drinking waterand new gear to expand the station into a five-bedroom, two bath, two kitchenspace research outpost. Equallyimportant are the four spacewalks planned for the mission, which are aimed atcleaning metal grit from a massive gear that turns the starboard solar arrayslike a paddlewheel to always face the sun. 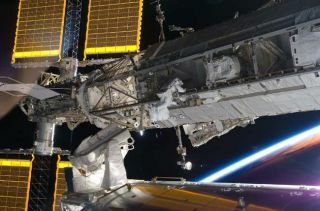 The gear has been damaged for morethan a year, with Stefanyshyn-Piper leading a spacewalking team on the arduouschore of replacing bearings, cleaning the mechanism and greasing it up toextend its performance. ?This iswhat you have to do to live and work in space 24-7, 365,? NASA chief MichaelGriffin told SPACE.com, adding that making unexpected fixes are vitalfor the station and future trips back to the moon and on to Mars. ?It?s a prettyhumble, workman-like task, and I?m sure there?s going to be some bobbles as wefigure out how to do it, but this is the kind of stuff that you have to do.? Today?sspacewalk will be the 116th trip outside the station for maintenance andconstruction. To date, astronauts have lived continuously aboard the stationsince 2000 and spent 725 hours and 40 minutes working in space to build thestill un-finished orbiting laboratory. NASA planseight more shuttle missions to complete the space station, as well a ninth to overhaulthe Hubble Space Telescope, before retiring its aging, three-orbiter fleetin September 2010. Stefanyshyn-Piperand Kimbrough are going into today?s spacewalk determined to keep careful trackof all of their tools. During aTuesday spacewalk, a 30-pound (13-kg) bag of crucial tools for cleaning up thegear escaped fromStefanyshyn-Piper while she was trying to clean gobs of grease that hadleaked all over her equipment. "You haveto learn from your mistakes. We're definitely not going to do it again, you?renot going to see us lose another bag,? she told the Associated Press Wednesday. ?We?re going to double and triple check everything from here on out.? With theloss of Stefanyshyn-Piper?s bag and the grease guns, scrapers and wipes it included,she and Kimbrough will have to share their remaining gear in order to completetheir cleaning tasks. They plan to improvise a makeshift lubrication tool bypreparing some terry cloth-like wipes with the space grease ahead of time toavoid slowing each other down too much by having to share one set of tools,mission managers said. Theastronauts will also add a touch of grease to the space station?s Canadarm2robotic arm. They?ll also reposition pair of carts on the outpost?sbackbone-like truss to set the stage for the deliver of new starboard solarwings early next year. But thesolar array gear cleaning will take the bulk of their time and so far, theorbital tune-up job has gone well, NASA officials said. ?It?s goingperfectly,? said space station flight director Ginger Kerrick on Wednesday. ?Just as expected.? NASA isproviding live coverage of Endeavour's STS-126 mission on NASA TV. Click here for SPACE.com's missioncoverage and NASA TV feed.